As the evangelical icon The Rev. Cecil ‘Chip’ Murray fired at 600 hundred elated supporters with three chants of “Hallelujah! Hallelujah! Hallelujah!” they joined elected officials and community leadership in celebrating approved funding for an underground station on the planned Crenshaw Line at historical Leimert Park Village, last week. Acting on a motion co-sponsored by Supervisor Mark Ridley-Thomas, Mayor Antonio Villa­raigosa and four other Metro directors, the board voted to include the Leimert Park Village station in the new Crenshaw-to-LAX light rail line after securing the necessary funding in its upcoming budget. The most recent estimate for the Leimert Park station is $120 million, and Metro’s fiscal year 2014 budget contains $460.5 million in uncommitted funds—more than enough to safeguard against a significant cost overrun. Further burnishing the station’s funding prospects was the recent commitment by the Los Angeles City Council of $40 million toward the design and construction of the station. Supervisor Ridley-Thomas, who is also on the Metro board and who has championed the Leimert Park station for years, greeted the vote with a deep sense of satisfaction and gratification. Rev. Murray began a celebration that almost never was. One that was stalled for two years in tangled negotiations and left on a respirator to die. The 8.5-mile Crenshaw Line would run south from the Expo Line at Exposition Boulevard along Crenshaw Boulevard through Inglewood, terminating at the Green Line near LAX. said Karen Bass in a statement. During a Metro Transportation Authority board meeting last week, Mayor Villaraigosa seconded a motion by Mark Ridley-Thomas, which insisted that a Leimert Park station be inclusive in the planning of the Crenshaw Line. It ended two years of fighting for a light-rail station in Leimert Park, with the approval of $120 million full-funding for a stop in the heart of L.A.'s African American community. “Good News! Good News! Good News! 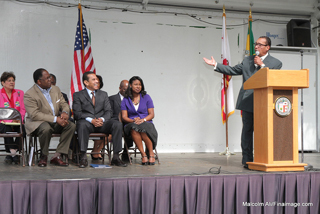 Good News in Leimert Park Village today, clap your hands and give somebody a high-five and tell them there is Good News in the Village today!” proclaimed Ridley-Thomas at the rally. “In other words we did it together. Say Mr. Mayor we did it together! Mr. Council President we did it together! Ms. (Jan) Perry we did it together! We did it together with the Sentinel and other newspapers! We did it together,” Ridley-Thomas added, also mentioning churches, clergy and community organizations that were instrumental in solidifying the station. That was the theme celebrated in the same location that three to four years from now will be an artery through, to and from the single region in Los Angeles that is most symbolic of African American culture. Mayor Villaraigosa smiled continuously and then reflected on the long journey of not just the Leimert Park station but also his 33-year relationship with glowing political superstar Ridley-Thomas. “For 33-years Mark Ridley-Thomas and Antonio Villaraigosa have been working together. From the co-chairs of the Latino/Black Roundtable to work on his campaign for city council, mine for the state assembly, my first second and third run for mayor, we have understood that when we work together, we get things done,” said Villaraigosa. Leimert Park was developed in the 1920s as an all-white neighborhood known for lush golf courses, but the 1965 Watts riots, Black musicians, writers and artists began to move in and transformed it into an African American cultural destination for entertainment, food and business. Sounds of Jazz can frequently be heard throughout the community, lined with shops, art galleries and the last Black-centric bookstore in the region. Leimert Park is the last African American business corridor in Southern California.